Envitia is a market-leading supplier of world-class spatial information technologies, helping customers in the defence, government and industry sectors to make better and faster decisions through the use of geospatial technology. The team at Envitia wanted to develop and modernise their website to more effectively market their products, including making it more responsive to mobile device users. 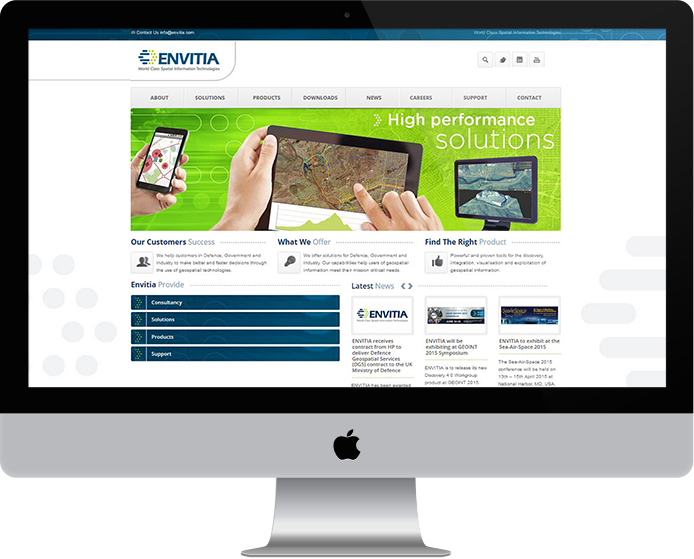 A modern, user-friendly content management system was also required, to allow Envitia’s staff keep the website up to date. As the objective was to rebuild the entire website from an old version into a new one, we worked closely with Envitia and top branding experts to ensure the new site had a modern feel and provided an effective marketing platform for the company’s products and services. Working closely with the client and branding designer, we incorporated their new brand throughout, delivering consistency with other corporate communications. We also collaborated to fully understand the target audiences, and deliver design and content that would meet their needs. Alongside the visual and technical design, our expert copywriter re-wrote the website’s content in order to concentrate more fully on the key messages and make the technical information more clear for clients, the general public and the media. Having worked closely with Envitia during the design and build phase, we then trained the staff team to carry out the routine administrative and updating tasks on the website themselves. This meant that once the new website was launched, Envitia’s staff team had the skills and knowledge required to manage much of the day-to-day maintenance themselves. Alongside these features, there is a complete custom-built support website, allowing customers to log in and gain support.